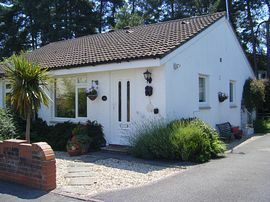 Stylish and well maitained cottage, set in a quiet wooded close with large driveway and garden. 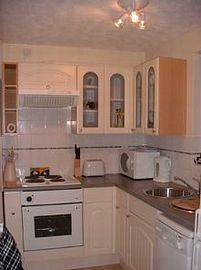 we aim to make sure that you have everything you need for a great trouble free holiday. Easily reached by road it provides and ideal base for discovering all that coastal and rural Dorset has to offer. 1/2 mile off the A350, we are 3 hours from London and Birmingham and 1 1/2 from Bristol. We are a 5 min drive from Poole railway station and the cross channel ferry terminal, and within a few minutes of a wide selection of restaurants and bistros. 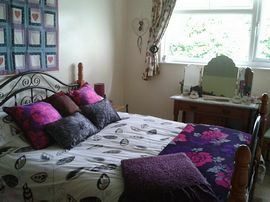 Recently decorated, it offers centrally heated, comfortable ground floor accommodation with beautiful decor and furnishings, ideal for use all year round. 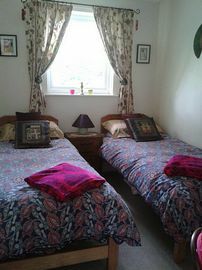 Sleeping 4 persons in two bedrooms, it has both a front garden with parking and an enclosed rear garden. cottage is on one level with 2 steps up into the house. 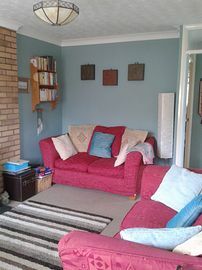 Large flat driveway with easily accessed garden through wrought iron gate. Large driveway, enclosed rear garden with patio and furniture. Sun-loungers.